I really can't complain because I got a $75 lunch gift certificate from the blogger prom to come here! After reading through everyone's review, we decided to get one dish from the secret kitchen, and a few lighter options. 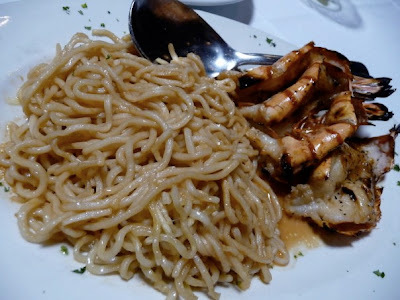 We ended up getting the colossal royal tiger prawns that came with the garlic noodles ($39.95), the traditional vietnamese salad (13.95), and the crispy rice paper roll ($9.00). We also got green tea ($7.00) and two desserts - the coconut cake with creme anglais, and the pineapple brioche with vanilla bean ice cream (both $9). I cannot believe the success of this event. I mean, I know how much people love Korean barbeque but this was ridiculously successful - so successful it was almost annoying. If you wanted to eat something, the lines were at least a 20 minute wait. Some lines moved faster than others because the restaurant owners were more efficient and set up some sort of cracked out assembly line. Other restaurants took too long to cook and then even longer to distribute. A lot of people were walking around with corn because they were cheap ($3) and fast. Next year, I hope they have a lot more sides featured. Korean bbq is awesome but Korean banchan is also a staple as well as a crowd pleaser. Apparently, there were 10,000 people who passed through the doors that day. That's so incredible. It's amazing to see how people come together for food. To organize this massive crowd to come to a charity event would be much more difficult, I'm sure. On August 1st, I drove to the California Science Center for the 7th Annual Project by Project Tasting Benefit. Every year I've wanted to go but couldn't make it for one reason or another. I finally got to go this year and I'm so glad I did! Plate by Plate is not just for foodies. I mean, obviously foodies will be more willing to pay up for tickets to a tasting event but it's really all about helping out theAsian Pacific Islander Small Business Program which in turn helps out micro businesses in Los Angeles, especially those of low income immigrants of Chinese, Korean, Japanese, Thai, and Filipino communities. So yes, not only do you have to have the stomach for this event but also the heart (cheesy, I know but it's true).